It's been over fifty years since the assassination of President John F. Kennedy, and the facts still don't add up. Even though the shooting was caught on camera, so many questions remain unanswered. When accused assassin Lee Harvey Oswald was shot and killed just two days after supposedly taking down JFK, the truth died with him, leaving everyone to speculate about what truly occurred during the President's final days. Since the assassination of JFK was caught on several cameras depicting the gruesome murder from many angles, the occurrence has been reviewed and studied by many. 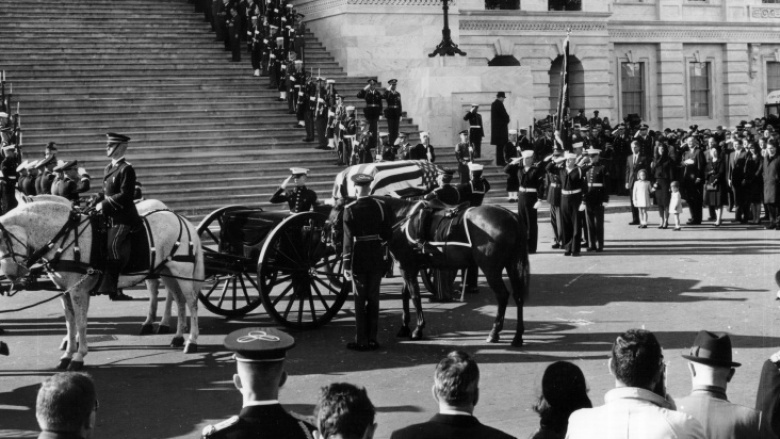 As we all know, the Secret Service is most known for their fast reflexes and intimidating demeanor, but during JFK's time in the White House, that had changed. According to Vanity Fair, the President's lax attitude had rubbed off on his staff and, as each year passed with him in office, the Secret Service grew lazier and lazier. Several former members of the Secret Service came forward about that day years later, claiming they were slow to respond to the shots fired since they'd been out partying the night before, and were sleep-deprived and even hungover. One particular agent, Abraham Bolden, described the details of that day in his book The Echo from Dealey Plaza. He describes how he specifically remembers that after JFK was shot, an agent shouted, "I knew it would happen. I told those playboys that someone was going to get the president killed if they kept acting like they did. Now it's happened." Bolden also discussed what it was like being one of the only African-Americans on the Secret Service team, and the racism he had to deal with. Soon after the book was released in 2008, Bolden was accused and convicted of attempting to sell a secret government file for $50,000 to the defendant in another case. Bolden claimed that he'd been framed for going public about the partying ways of the Secret Service, and how he feels it led to the death of JFK. Framed or not, it's clear in the videos that the everyone nearby, aside from his wife, failed to react until the third and final gunshot was fired. After JFK was shot, he was rushed to Parkland Memorial Hospital in Texas where he was pronounced dead. Texas state law rightfully stated that the President's body wasn't allowed to leave the hospital until an autopsy had been performed, but the Secret Service felt differently. According to Jacob G. Hornberger, president and founder of the Future of Freedom Foundation, a dispute broke out in the hospital when Dallas medical examiner Dr. Earl Rose attempted to prevent the Secret Service from taking JFK's body. According to Hornberger's article "The First Step In The JFK Cover-Up," there was a lot of shouting and cursing, before the situation forced agents to draw their guns and push their way out of the hospital with JFK's body. The casket holding JFK's body was then taken on Air Force One to Anders Air Force Base, where the military supposedly conducted the autopsy. Many have speculated that this move was the first of many performed by the government to cover up the assassination of the president. When reports surfaced about exactly what happened at the hospital, the public was led to believe that this was all normal, and that breaking Texas law by practically stealing the president's body was totally consistent with Secret Service training. However, many see this as a precaution taken to ensure that the details of JFK's autopsy weren't leaked to the public, especially if those details prove his assassination was a conspiracy involving our own government. The biggest conspiracy theory surrounding JFK's assassination is that many people feel the evidence shows there might have been more than one shooter. They've speculated that the first shot that hit JFK in the neck came from a different gun than the bullet that hit former Texas Governor John Connally immediately after. Rumors claimed there was a second gunman in the crowd or in another building, though examination of video evidence seems to prove that there was not. Dale Myers, a computer animator who studied the assassination for over 25 years, created a simulation of the event based on video footage from that day. The simulator allowed him to examine the viewpoint from anyone who witnessed the murder, as well as track the trajectory of each bullet. Myers told ABC News, "…the accuracy of the computer model would be such that you could then plot trajectories, you could take the wounds, the positions of the figures, you could see where the firing sources were from, or not from." This technology demonstrated that the bullet that first struck JFK in the neck was actually the same bullet that then hit Connally under his armpit. Myers points out that the trajectory from Connally's wound from the first seat of the vehicle lines up with JFK's, and that the two reacted to their injuries simultaneously. Additionally, each bullet's trajectory leads to the sixth floor of the Texas School Book Depository, where Oswald worked. Regardless, many still believe that one of the many conspiracy theories that have been told are closer to the truth.